Yussef El Guindi’s most recent productions include The Ramayana (co-adaptor) at ACT and Pilgrims Musa and Sheri in the New World also at ACT (winner of the Steinberg/American Theater Critics Association’s New Play Award in 2012; Gregory Award 2011; Seattle Times’ “Footlight Award” for Best World Premiere Play, 2011). Other productions include Jihad Jones and The Kalashnikov Babes, produced at Golden Thread Productions in San Francisco, at InterAct Theater in Philadelphia, and at Kitchen Dog theater in Dallas, as part of the National New Play Network. His play Our Enemies: Lively Scenes of Love and Combat was produced by Silk Road Theater Project and won the M. Elizabeth Osborn award. His plays Back of the Throat, Pilgrims Musa and Sheri in the New World, Jihad Jones and The Kalashnikov Babes, Such a Beautiful Voice is Sayeda’s, and Karima’s City have been published by Dramatists Play Service. Ten Acrobats in an Amazing Leap of Faith (winner of Chicago’s “After Dark/John W. Schmid Award” for Best New Play in 2006) is included in Salaam/Peace: An Anthology of Middle-Eastern American Playwrights, published by TCG, 2009. 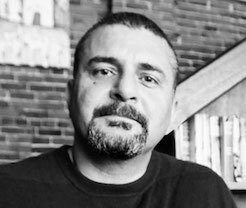 Yussef is the recipient of the 2010 Middle East America Distinguished Playwright Award. He holds an MFA from Carnegie-Mellon University and was playwright-in-residence at Duke University.